Hear what moms have to say about The Tuffet™! Joseph loves the tuffet! It's helped him sit up so he can play with his big sister like a big boy! 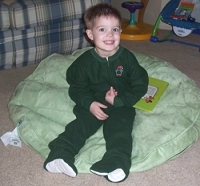 We just love our new Tuffet, which we all call the lily pad I was thrilled to see the excellent quality of the fabric. It is a joy to snuggle down on and big enough for myself and my 3 year old son to sit on and watch a movie or share books together. Attached is a photo of my son sitting on our new favorite piece of furniture!